Qira, the mysterious partner crime of Han Solo. She is looking extremely gorgeous in the above screenshot. www.famousmoviejackets.com is presenting an absolute fancy and superlative outerwear enthused from the movie Solo a Star Wars. We use real and genuine leather material externally to recreate this sophisticated Solo A Star Wars Story Qi’ra Leather Jacket. For the internal comfort lined up with the viscose material. The jacket is amazingly enduring and resilient. Therefore, all it needs indeed the one-time investment so that you can enjoy this fashion wear for ages. The classy biker-style cropped leather jacket is fascinating enough as having broad turndown Fur lapels and YKK zip for front closure. A comfy and warm outfit to get saved from extreme windy and cold weather. Elegance touches the sky when you wear this beige jacket with black jeans and the black tee. 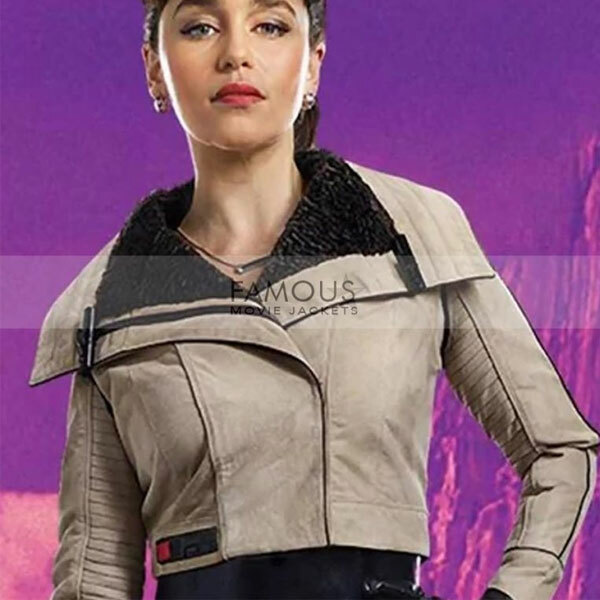 So, This season stays cozy and stylish wearing this Qi’ra Solo a Star War jacket.